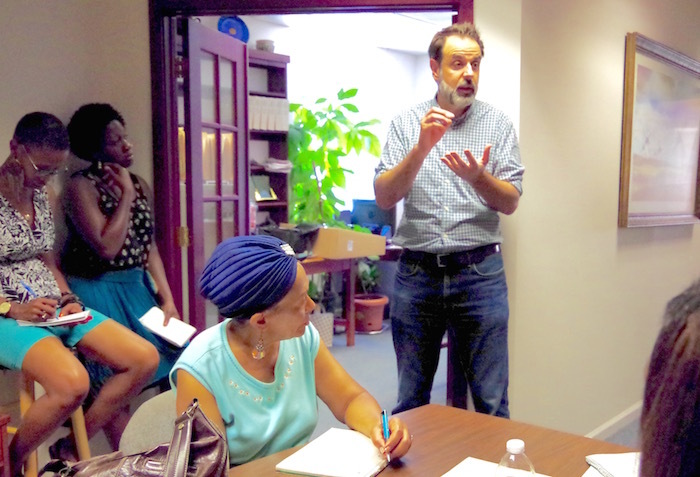 Aug. 4, 2015, 9:44 a.m.
WNHH, debuting next week, aims to extend the community journalism of the New Haven Independent to the airwaves — and to reflect the city it’s in. By Dan Kennedy @dankennedy_nu Aug. 4, 2015, 9:44 a.m.
“It’s your show and it’s your microphone and they are your guests. You need to be the gatekeeper,” said Dankosky, vice president of news at Connecticut’s public radio network WNPR and host of the daily public affairs program Where We Live. For Independent founder and editor Paul Bass, WNHH is a logical next step. The station — in partnership with La Voz, a Spanish-language newspaper that is also the Independent’s landlord — will broadcast weekdays from 4 a.m. to 4 p.m. and stream online 24 hours a day. Programming will include six or seven hours a day of local music, talk shows with newsmakers (including a weekly call-in show with Mayor Toni Harp) and a variety of other features, with Spanish-language shows from La Voz on weekends. Content will be repeated to fill out the schedule. Dankosky leads a session on the basics of radio for staffers and volunteers. At left: Independent staff reporters Markeshia Ricks and Aliyya Swaby. Seated at the table: N’Zinga Shäni, producer and director of the OneWord Progressive Institute, a New Haven-based social-action organization. Photo by Lucy Gellman. WNHH is one of a wave of LPFM stations expected to begin operations in the coming months. According to Michi Bradley, founder of REC Networks, an advocacy organization for community radio, about 2,800 groups applied for licenses when the FCC made them available in 2013. The FCC approved 1,840, Bradley says, and 535 are reportedly on the air, joining 773 LPFM stations that were already in existence. A typical LPFM station can only be heard within a three-mile radius of its transmitter. Indeed, WNHH’s footprint is so small that New Haven residents south of Interstate 95 won’t be able to hear it, though the signal, at 103.5 FM, will extend north of New Haven into neighboring Hamden. 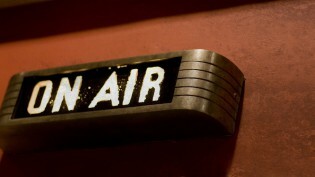 In any case, Bass suspects that the Internet stream and podcasts of past shows will prove more popular in the long run. 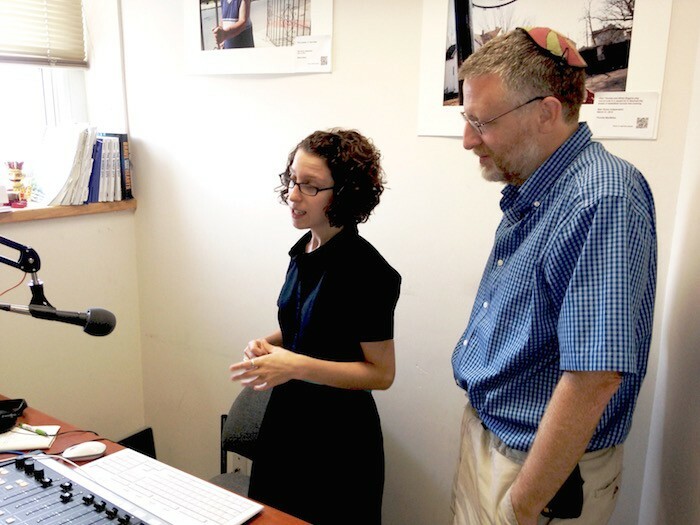 Most of the station’s funding comes from a two-year, $150,000 grant from the Knight Foundation (disclosure: Knight is also a funder of Nieman Lab) and another $150,000 spread out over three years from the Connecticut-based Seedlings Foundation. Bass expects to be able to operate the station for at least three years and has already begun fundraising efforts to keep it going beyond that. With more and more of his audience moving into streaming Internet radio and podcasts, he has hopes for a brighter financial future. Back in 2013, Bass told me that he got his inspiration for community radio from Tim Coco, an advertising executive who is the general manager of WHAV, a nonprofit Internet radio station in Haverhill, Massachusetts. Over the past several years, WHAV has pumped up its news offerings even as the daily and weekly newspapers that cover Haverhill — both owned by the Alabama-based chain CNHI — have cut back on coverage. Coco was awarded an LPFM license around the same time as Bass, and he hopes to begin broadcast operations at 97.9 FM later this year. Coco amplifies his news coverage with a strong web presence — something Bass plans to do as well. WNHH will not have a separate website, Bass told me, because he wants people to think of the Independent and the radio station as one entity. Arts coverage in the Independent — already far stronger than it was several years ago because of an infusion of grant money — should become even more of a presence, Bass says, as radio stories are repositioned as Independent articles with embedded audio. Nearly 60 percent of New Haven’s 130,000 residents are African-American or Latino, according to federal census data. WNHH’s programming will reflect that diversity with offerings such as a hip-hop show hosted by local DJ Joe Ugly (his Ugly Radio Internet station will be simulcast from 6 to 9 a.m.); shows hosted by New Haven police officer and social activist Shafiq Abdussabur and his wife, Mubarakah Ibrahim, a well-known fitness advocate for Muslim women; and interviews with local entrepreneurs, a joint venture with La Voz aimed at highlighting success stories both within and outside the Latino community. Independent staff reporters will be on the air as well. For example, one of the issues Markeshia Ricks wants to explore is the reentry of former prison inmates into the community. “Apparently they drop folks off at six in the morning and say, ‘Here you go, have a nice life. Don’t come back to prison,’” she says. From the beginning, the Independent has emphasized civic engagement through its closely monitored comments sections and its attention to the details of neighborhood life. WNHH is an opportunity to build on that. Josh Stearns, director of journalism and sustainability for the Geraldine R. Dodge Foundation, believes that LPFM stations represent new opportunities for local conversation. Overseeing all this is Lucy Gellman, a 25-year-old art historian who’d moved to New Haven to run the print room at the Yale University Art Gallery. She began writing music reviews for the Independent. And when Bass offered her the job of WNHH station manager, she took it, even though she had been planning to move to North Carolina to pursue a Ph.D. at Duke University. For John Dankosky, who has featured Bass often on his radio program, helping with the launch of WNHH is a way of fostering collaboration in a time of diminishing resources. Barring any last-minute glitches, the talking begins next week. Dan Kennedy is an associate professor of journalism at Northeastern University and a panelist on Beat the Press, a weekly media program on WGBH-TV Boston. His blog, Media Nation, is online at dankennedy.net. His most recent book, The Wired City: Reimagining Journalism and Civic Life in the Post-Newspaper Age (University of Massachusetts Press, 2013), tracks the rise of the New Haven Independent and other online community news projects. Photo of Lucy Gellman and Paul Bass by Dan Kennedy. POSTED Aug. 4, 2015, 9:44 a.m.
Kennedy, Dan. "In New Haven, a low-power FM experiment seeks local conversation — and financial sustainability." Nieman Journalism Lab. Nieman Foundation for Journalism at Harvard, 4 Aug. 2015. Web. 25 Apr. 2019. Kennedy, Dan. "In New Haven, a low-power FM experiment seeks local conversation — and financial sustainability." Nieman Journalism Lab. Last modified August 4, 2015. Accessed April 25, 2019. https://www.niemanlab.org/2015/08/in-new-haven-a-low-power-fm-experiment-seeks-local-conversation-and-financial-sustainability/.